I have a Rails app that uses background images from a style.css.scss file. I have found multiple ways of having the images show up on localhost, but no ways to get them to display on Heroku. I have looked at MANY posts on SO like this and this, as well as other sites like this, but nothing has worked so far. However, I have also tried background-image, image-url, asset-url, and numerous other permutations as found in the linked SO posts. Any ideas on how this can be resolved would be happily received! Look at your paths.. It must be something with your configuration. You've got your absolute path in code somewhere, either that or it's on track to something related. Search your code-base and make sure you don't have your own machine's absolute path hard-coded anywhere. Make sure it is all relative. /Users/elizabethbayardelle/Dropbox/Code/BIA/ should not be anywhere in your source, but somewhere it is being used in your herokuapp instance. On your localhost screenshot you've even got a path to heroku.com... how? A second take over how you've configured things will fix this I'm sure. I think the main problem in Heroku is, its unable to load the bootstrap.css. You have to solve this first. specify about this in application.js just after jquery_ujs reference. And then remove the bootstrap href references from the <head> in your view file. If you want to use asset_path in your stylesheets, you'll need to convert them to ERB templates. Example: application.css.erb -- This makes the asset_path helper available within the template. the image is not found as by default herokuapp create a subdomain for your app. Found this in the Rails 4 Asset Pipeline documentation (2.3.2). I know I posted a variation of this earlier, but maybe try each of these below and see what works? Since precompilation is done in production mode only, no need to explicitly specify the environment. gem 'sass-rails', "  ~> 3.1.0"
I see multiple issues related to your configuration. 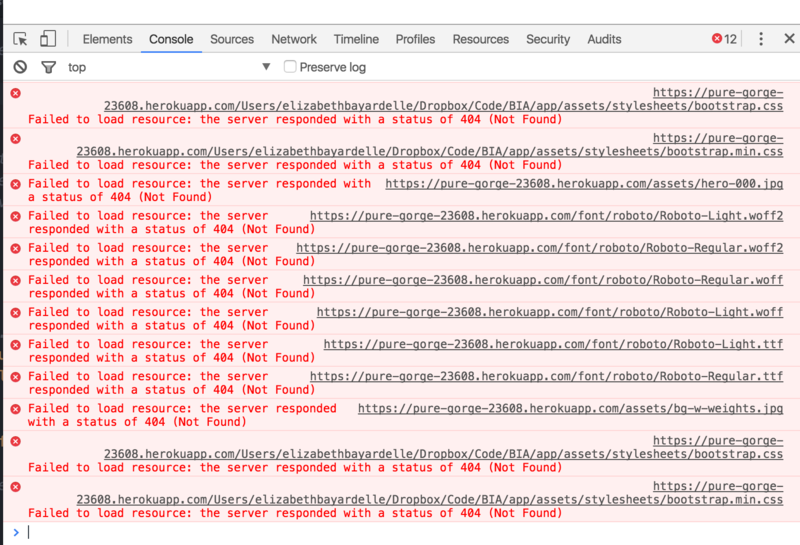 The images you posted show the 404 errors, but the errors on localhost are different from the ones on the Heroku app. The ones on the Heroku app are related to an absolute path for a CSS file, and once you resolve that errors you'll be able to see the images on Heroku. The Heroku app is referencing an absolute path to a bootstrap file. The absolute path points to a file on localhost. Since the file exists on localhost it doesn't create the same sort of problem when viewing your app on localhost as it does on Heroku. hint: How do I find all files containing specific text on Linux? When you find the files that contain the absolute path references to the bootstrap file(s), change the reference so that it is a relative path instead of an absolute path. Good luck and keep at it, your web site looks promising! Unfortunately, between all of the wonderful answers here, I never did solve the problem. I did, however, figure out a slightly hackey workaround to use erb-linked images from the html.erb documents instead of the .css.scss documents. Definitely not perfect, and it doesn't solve the great Heroku CSS image mystery of 2016, but it works well enough for the purposes of this site. Thank yous to all of my answerers for taking the time to dig into this with me. Not the answer you're looking for? Browse other questions tagged css ruby-on-rails heroku or ask your own question. Heroku does not serve background image, localhost does?